The Springsoft SS and PA series reverse osmosis systems are engineered to combine up to five distinct purification stages to make the cleanest, freshest water available. Inlet water is passed through a sediment filter, reducing fine particles and debris. The water then passes through up to two additional stages of filtration, reducing unwanted chlorine plus other tastes and odors. Afterward, the water passes through a semi-permeable membrane which effectively reduces up to 99% of unwanted impurities. This purified water is sent to a storage tank and accumulated for future use. Our 4- and 5- stage systems also include a final polishing filter to impart a fresh, delicious taste to the final product water. The reverse osmosis system is usually connected to a specific stand alone drinking faucet and/or a refrigerator water dispensing system along with its ice maker. Various options can be customized to accommodate your specific water purification requirements and decor. A Springsoft reverse osmosis drinking system constantly and automatically replenishes the storage tank. Storage tanks are available in many capacities for individual requirements. Adding an additional or larger storage tank minimizes the possibility of running out of purified water. 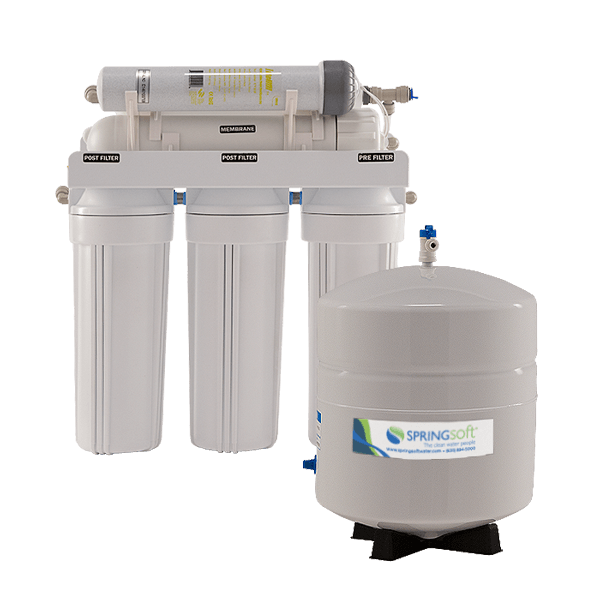 Your Springsoft Water Specialist will assist in customizing a system that best meets your requirements while staying within your budget. Drinking Water Faucets: Springsoft stocks and has access to a wide variety of faucet colors and styles to match custom decor in your home or office. Delivery Pump: Utilized to increase pressure of the delivered purified water to its point of use. Some refrigerator ice makers require significantly more water pressure than is provided by a stand alone storage tank. Also, these pumps are useful when the reverse osmosis system is located at an extended range from the point of use. Booster Pump: Utilized to increase water pressure entering the reverse osmosis system. This not only improves product water production, but also improves water quality. Permeate Pump: Non-electric pump that forces water into the reverse osmosis storage tank, reducing membrane back pressure and maximizing available feed pressure. This greatly increases the efficiency of the reverse osmosis system. Reverse Osmosis Storage Tanks: For applications requiring additional purified water storage, various reverse osmosis tank capacities are available. Remineralizing Filters: These filters are installed as the final stage in a reverse osmosis system. They increase PH, alkalinity and negative ORP while also adding beneficial minerals back into the water.